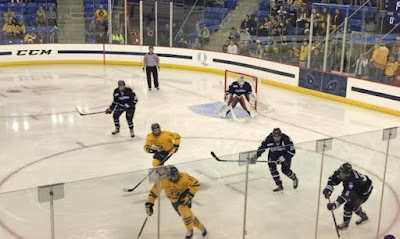 Freshman forward William Fallstrom scored two goals including the game winning goal and an empty net goal to lead Quinnipiac to a 4-2 win over UConn in the teams home opener at the Frank Perotti, Jr. Arena at the newly renamed People's United Bank Center. 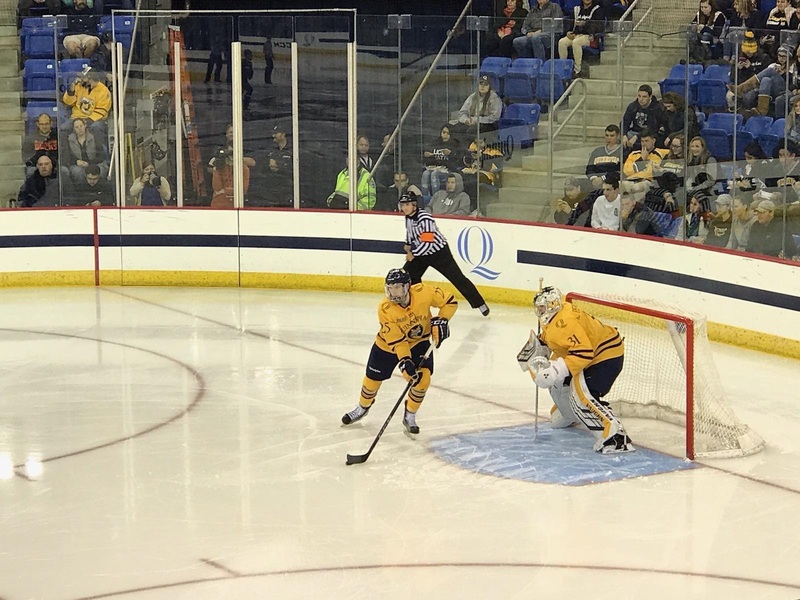 It was the first time since the 2015-2016 that Quinnipiac opened the season with two consecutive wins and that season ended with a Frozen Four appearance in Tampa. The Bobcats scored the first two goals less than two minutes apart. Senior defenseman Brandon Fortunato got the scoring started when he took a pass from freshman Desi Burgart and found himself wide open and beat UConn goaltender Adam Huska short side just 4:22 into the opening frame. Less than two minutes later Wyatt Bongionvanni fed Odeen Tufto in front who corralled the puck on his stick faked out Huska and put a back-hander past him for his second goal of the season. UConn got one back late in the first period on freshman Jonny Evans first collegiate goal. Fallstrom scored the eventual game winner in the second period when Alex Whelan fed him cross ice and Fallstrom beat a diving Huska. Quinnipiac only allowed two UConn shots on goal the entire second period. "The whole month of September and into this month we have been stressing good defense, Fortunato said." Quinnipiac continued its strong defense allowing only five shots in third period and just 13 for the entire game. "Shot blocking is one of the big parts of our culture here, Fortunato added. I think our freshman have done a good job adapting to our culture and it showed tonight." An ugly hit in happened early in the third period where Brogan Rafferty knocked out Ruslan Iskhakov who lost the puck in the offensive zone and looked down to find it only for Rafferty to run into him. Rafferty never launched or left his feet and the hit was clean in my opinion but he was still given a five minute charging penalty and a game misconduct. UConn never scored on the major penalty but added a power play goal later on in the game by Carter Turnball. Fallstrom added an empty net goal while Keith Petruzzelli made 11 saves for his second consecutive win. Quinnipiac returns to action on Friday night when they welcome 18th ranked Boston College (0-2) and 11th overall pick Oliver Wahlstrom who is one of 11 draft picks on the Eagles roster into Hamden for the first time ever. Gametime is set for 7 pm at the People's United Bank Center.